Beautiful, wonderful mementos! I’m terrible about getting things framed…even the easier stuff, so good on you girlie! I love that you kept that sweet note that JAMAL wrote, and of course The Kiss. Of COURSE. So sweet. And now you’ll always have reminders of that amazing moment in time. I adore the little note that you framed. 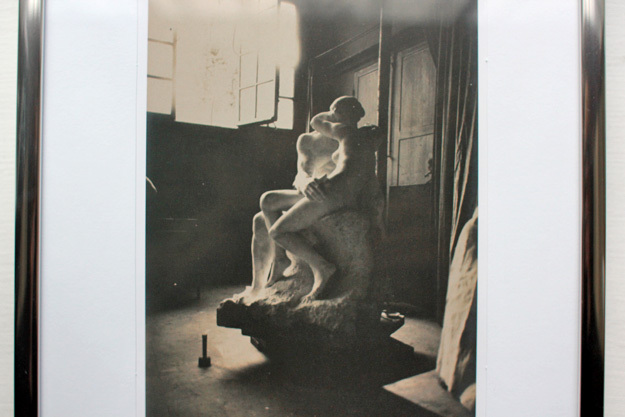 Of course, the Rodin print is just as special, but there’s something so warming about that crumbled piece of paper! I’m so glad you framed it! Oh I love that you framed JAMAL’s (note capitals) note, that’s so cute! Really I think you should think about mounting it properly to give it the gravitas it deserves. God bless JAMAL! And when is he going to introduce himself to us?? One day I’ll have a mat custom cut for it. Can you image how wonky-shaped that would be? One day, for sure. JAMAL has actually left ONE WHOLE COMMENT on this blog, can you believe it? You might have missed it, it was a long time ago. Let me see if I can find it…aha!. I think that’s as much as we’re going to get out of him, haha. too sweet! bless his little sweaty nervous socks! those are the kinds of memories you cannot buy! The light in that photo is so beautiful. And I love that you had to go round twice because you were so swoony the first time. And of course I love, love, love the note and it looks so happy in that little frame. It just makes me think about the planning that went into asking you. He planned it all out and kept it a secret and wanted to wait to ask you in your favorite place in the world. So sweet! xoxoxo!! That note is beyond ADORABLE!! So sweet Erin! It’s definitely the kind of thing you want to hang on to! Jordan was so nervous on the flight over to Santorini where he proposed that I thought he had food poisoning – he was practically green.